Can you build a great sales team on salary? As I advise companies on how to build effective sales teams, the topic of compensation looms as the 400-lb gorilla in the corner. This gorilla is a very opinionated fellow. He’s distinctly of two minds. On the one hand, he believes that in order to develop a committed sales team, a system of commissions that give top sales folks the opportunity to make lots of money is essential. The terms you hear are “uncapped”, “incentive-based” and “performance-based”. Under this scenario, a salesperson will only perform if there is a LARGE carrot. 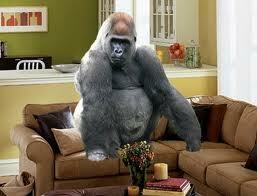 This gorilla is deeply committed to the idea of greed and self interest as a motivator. On the other hand, he’s also seen the results of that paradigm and thinks there may be another way. Nicely encapsulated in a recent inc.com article, our gorilla thinks sales folks shouldn’t have a completely different pay plan as the rest of the company. After all, there are superstars in every department, why shouldn’t they be compensated on effectiveness and effort? So, our gorilla is in a quandary. To commission or not commission? Over the years I’ve observed many sales teams and the impact of both salary and commission-based compensation plans. What have I seen? 1) In commission-plan orgs: sales teams become stratified with top performers performing at 100-200X the performance of the lowest performers. The top performers are highly focused hunters, rarely team players, highly resistant to management, and extremely effective in their use of time and resources. Lowest performers take the lion’s share of manager’s time (most of whom come from the top performer camp) and rarely are able to improve their skills enough to make a difference. Of course, the managers, since they have the mindset of top performers, are usually unable to effectively coach the low performers. The result? Relatively stable top performers set and a conveyor belt of low performers. 2) In salary-plan orgs: these teams are generally composed of middle-to-low performing sales folks. Top performers are not attracted to these organizations. Managers also come from this middle-performing set. Generally they are better at getting “good” performance from their folks, so the low performers may improve their skills and achieve mid-level performance. Consistency is a feature of this type of organization, but mediocrity is more often the result. So what is the answer? If you’ve ever seen the desperation on the face of a salesperson just short of goal on the last week of the month, you can understand why a commission-only plan can create more problems than it solves. A middle ground of base plus commission is probably a good compromise. Care must be taken that the sales team is part of the whole company’s culture. Stay tuned for more on this fascinating topic!